As a kid in the illustrious suburb of Worth “The Friendly Village,” Illinois, every Friday of my grade-school life, my family ordered take-out (never delivery) pizza from Pizza Pete at the corner of 111th Street and Oak Park Avenue. This pizza had a beady-eyed mascot I will remember until the day I die, crumbly fennel-filled sausage, and—thin crust. My southwest Chicago-side family, friends, and neighbors knew of deep dish, of course, but it was a special occasion kind of thing. Like downtown tourists, my teenaged friends and I would make a special trip to Gino’s East off the Mag Mile to taste the Chicago classic, or hit the Giordano’s at 127th and Harlem for stuffed pizza after school dances. But deep-dish pizza, for as much as it’s touted as the official Chicago food, was no more a part of our daily lives than holiday eggnog or the Plush Horse ice cream parlor on Southwest Highway. Thin-crust, tavern-style pizza cut into squares, on the other hand, made up a significant portion of my diet. I am not alone in my frustration over excellent Chicago pizza that gets overlooked by deep-dish madness. Steve Dolinsky, a longtime Chicago food reporter, appears to have made spreading the work about Chicago’s other pizza one of his driving forces in life. His new book, Pizza City, USA: 101 Reasons Why Chicago Is America’s Greatest Pizza Town goes even further to dispel the national myth that all Chicagoans eat deep-dish pie and nothing else. He also runs Pizza City, USA, a guided two-to-three-hour pizza tour that covers a variety of different Chicago pizza styles—not just deep dish. To discuss our mutual pizza crusade, Dolinsky suggested that we meet at Chicago’s legendary Pat’s Pizza, now a third-generation pizza joint. Pat’s wafer-thin, crisp-and-never-soggy crust has made it a staple for my own family’s Friday night dinners (although we always do delivery). Steve tells me that at Pat’s, “they have actually drilled an extra hole on their dough sheeter” to get the pizza even thinner, because the standard sheeter didn’t get the pizza as thin as they wanted. That actually explains a lot. See, I’m already learning. The Takeout: How did deep dish pizza become such a Chicago signature? Steve Dolinsky: It started here in 1943 at Ricardo’s Bar. They wanted to give the GIs coming back from the war something more valuable. Remember how the Chicago dog was born at the World’s Fair? A lot of the competition between Italian street vendors kind of one-upping each other—we’re going to add a pickle, we’re going to add peppers for a nickel—the same thing with the pizza. The pizza was a freebie in the bar. As Mark Malnati told me, it was an afterthought. They’d pass the pizza around the bar, cut it into small squares, they want to get you to get something salty in your mouth so you keep ordering beers, keep drinking. So, the idea of charging people for a pizza was crazy. They talked to Blodgett, which is the oven company they still use, for specs on a pan which didn’t exist, so they used a cake pan and sort of created this pie. It was literally born at Ricardo’s Bar, which became Uno’s in ’55. Because in ’55 when they opened up Due down the street, they decided they should call the first place they had something else besides Ricardo’s Pizza, so they called it Uno. They were they only ones in town and it became this tourist attraction—that’s why we’re known for it. Because there was no one else in the country doing this deep-style pie. And then the guys at Giordano’s on the South Side took it one step further and created stuffed pizza. So the fact that we have both of those that were created here, gives us the credibility and the history in terms of deep. TO: As a Chicagoan, even with thin crust, I don’t understand the giant triangles of New York pizza; I grew up fighting over square center pieces and the teeny triangle corners of the tavern cut. SD: Yep. It’s a very Midwestern thing. I would say they were born here because they’re the oldest—for sure there are records of it back in the ’30s—mostly Taylor Street in Little Italy. But, if you go to Milwaukee, if you go to Michigan—we’ve had square-cut pie in the Midwest for a long time. And we call it the square-cut, the party-cut, the tavern pie. You don’t have to be from Chicago to know that. TO: When did pizza hit its heyday then? Like the ’70s? SD: Probably the ’70s, yeah. Because ’71 was Lou Malnati’s, and I think Gino’s East was right around there in the early ’70s, and then ’74 was Giordano’s. And the Home Run Inn has been around since the ’50s. Tavern-style. TO: Because it wasn’t like kids in the ’50s were hitting pizza parlors instead of the soda shop. SD: Right. They were going to burger joints. But I think the heyday was, you’re right, the ’70s for sure. TO: On your pizza tours, you make an effort to offer a variety of kinds of Chicago pizza, including thin crust and deep dish. 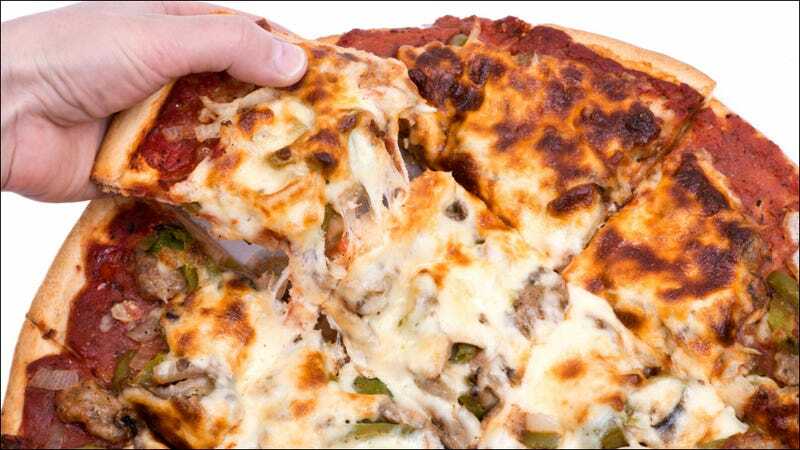 A big chunk of Chicago pizza is this style of pizza. And that’s the only reason I’m kind of going on and on and blathering about tavern-style is Chicago-style. Because that’s what I found. When I call a place up anonymously and say, “Hey, what are you guys known for? What’s your specialty?” They would invariably say thin, and, if you dig a little deeper, “What do you mean by thin?” “Well, tavern-cut, thin and crispy, sauce and cheese pushed all the way to the edge.” That’s thin to them. It’s like I say in the book, deep dish is to Chicago as Times Square is to New York. So, what if I go to New York and only eat in Times Square? “Oh, all you have is Bubba Gump Shrimp here! What a ridiculous city.” It’s the same thing! TO: Chicago is known for particular toppings too, right? Like the crumbled bulk sausage instead of sliced sausage. SD: I think the bulk sausage is for sure Chicago. The giardiniera is for sure only in Chicago. Other toppings that are local or significant? I mean, a stuffed pie is built as unique—the way those pies are built. I would also say—I don’t think it’s pizza, but—pizza oven grinders. You know, Lincoln Park [Chicago Pizza And Oven Grinder] claims to serve pizza, but it’s really just melted cheese in a bread bowl. But the bulk sausage, the Italian beef from a sandwich, and the giardiniera would be only in Chicago. And I say this because I’ve been to 60 places in New York, so I’ve seen their pizzas, and eight and a half times out of ten, it’s either cheese or pepperoni. And that’s it. TO: We’ve talked a lot about tavern pizza being the most representative style in Chicago. Let’s get the definition in one neat paragraph. SD: Tavern-style pizza is square cut, thin and crispy, sauce and cheese pushed all the way to the edge, with the crust reminiscent of a saltine. The meat is generally bulk sausage pinched and pressed with a fair amount of fennel, and another Chicago topping would be giardiniera. TO: So it seems like Chicago being identified with deep dish pizzas is an anomaly. SD: I think it’s partly true, but it’s also lazy. It is a Chicago creation, no doubt about it, but we’re more than that. Most of the deep dish is, as you know, within six blocks of Michigan Avenue. I feel like we have to tell people outside of Chicago that this is what we eat. We don’t just eat deep dish. I’m not disparaging deep dish. Again, I can appreciate it. It’s just not our daily pizza. Right? You’re with me as a Chicagoan?